RANK: General der Infanterie z.V. 13 March 1897: Entered the Army as a Sekondeleutnant in Oldenburgisches Infanterie-Regiment Nr.91. 1900-1901: Served in the 3. Ostasiatisches [East Asian] Infanterie-Regiment of the German Expeditionary Corps during the Boxer Rebellion in China. 1902: Adjutant of the II. Battalion of Infantry Regiment 91. 1 October 1904-20 July 1907: Detached to the War Academy. 1 April 1908: Detached to the Great General Staff. 22 March 1910: Aggregated into the Great General Staff. 1 April 1910: Transferred into the Great General Staff. 22 March 1912: Military Attaché at the Embassy in Tokyo, Japan. 23 October 1914: General Staff Officer of the 89th Reserve Infantry Division. 26 November 1914: General Staff Officer of the 31st Infantry Division. 9 May 1916: Detached to the German Military Mission in Turkey. 29 May 1916: Chief of the General Staff of the Rear Staging Area Inspectorate of the Turkish 2nd Army. 1 January 1917: Inspector of the Rear Staging Area Inspectorate of the Turkish 2nd Army. 26 March 1917: Chief of the General Staff of the Turkish Army Group Caucasus. 1 October 1918: Delegated with the post of the German Military Plenipotentiary in Constantinople, Turkey. March 1919: Representative of the High Command of the Army on the Commission for the Handling of Polish Questions, Danzig. 9 May 1919: Relived from this position and transferred to Grenadier Regiment 2. 19 May 1919: Deputy Chief of the General Staff of the II Army Corps. 1 October 1919: Chief of the General Staff of Wehrkreis [Military District] Command II. 12 April 1920: Transferred into the Reich Defense Ministry. 1 February 1921: Chief of Staff of the Inspectorate of Army Training and Education Services. 20 March 1922: Chief of Staff of the 6th Division. 19 January 1925: Commander of Infantry Regiment 10. 1 February 1927: Commander of the Dresden Infantry School. 31 January 1930: Retired from the Army. April 1934-July 1938: Military Advisor to Generalissimo Chiang Kai-shek in China. 10 July 1939: Placed at the disposal of the Army. 28 August 1939: Commanding General of the Deputy IV Army Corps and Commander of Wehrkreis IV, Dresden. 22 May 1940-31 May 1940: At the same time, Military Commander of the Netherlands. 26 June 1940-31 July 1940: At the same time, Military Commander of Luxembourg. 15 July 1944: Army High Command Leader Reserve. 20 July 1944: Mobilization regulation waived (suspected of involvement in the 20 July 1944 plot to assassinate Adolf Hitler). 29 July 1944-4 May 1945: Arrested by the Gestapo for complicity in the assassination plot and imprisoned in several concentration camps including Dachau. 4 May 1945: Liberated by U.S. troops while being evacuated from Dachau by SS guards. 7 March 1951: Sentenced to 12 years’ imprisonment in Brussels for the deportation of about 25,000 Belgian Jews and the execution of Belgian hostages, but released three weeks later. 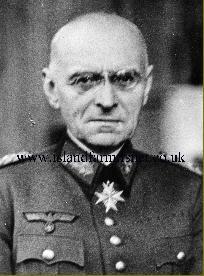 German Cross in Silver: 20 April 1943, General der Infanterie z.V., Military Commander of Belgium-Northern France.